It has been easy for us to provide an internet news roundup for UK Food Waste this month, because we are spoilt for choice! 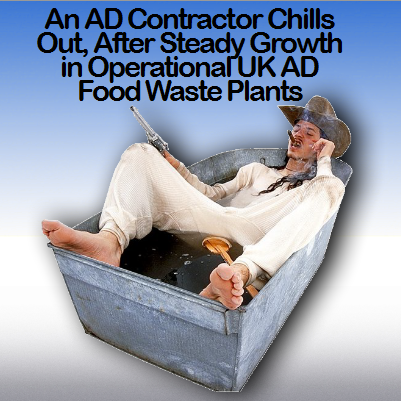 There are a number of news items which have been posted for a variety of food waste anaerobic digestion projects which show that Anaerobic Digestion UK is doing OK. This news seems to confirm the gradual growth of business in the AD sector. In Knutsford, Cheshire, a power plant application seems to be stumbling somewhat, but in Scotland it is a different matter with a £4.5m food waste anaerobic digestion plant agreed. In Wales, they are ahead of the game with a new Biogen and Iona Capital plant opened, and in the commercial sector Mark & Spencer is clearly doing very well to digest almost 90% of its food waste already, and is reporting internally on their waste plans including plans for further Anaerobic Digestion treatment. That just leaves the farm biogas sector to report on, and again, there is positive news with Wyke Farms including biogas power in their announced £3m spend on self sufficiency. We finish up with information on the Green Investment Bank's (GIB) own market report for anaerobic digestion, which moves the bank on with its policy making and investment strategy work on funding within our sector. The new report will help to inform the GIB’s strategy on debt investment in the sector as well as being a useful resource for the industry and investment community. The Integrated Waste Plant (waste and power plant) in Twemlow by Cres Biogas has hit turbulence. See more at: ᔥCouncil's stance on power plant comes as a shock to residents - Knutsford Guardian “The EA objected to the application in February, causing the applicant to make amendments that supposedly answered all its concerns. The EA’s report prompted the Health Protection Agency to publish concerns for public health, and the local school to withdraw its support. So, it seems unfortunate that the parish council continues to support plans that the EA have objected to.” The proposal includes 47,000 tonnes of slurry and food waste coming in to the AD plant and 41,000 tonnes of digestate being removed." "Caernarfon, Gwynedd (PRWEB UK) 5 July 2013 Biogen and Iona Capital have welcomed His Royal Highness The Prince of Wales, to the Biogen GwyriAD Anaerobic Digestion plant, the first anaerobic digestion plant built specifically under the Welsh Government’s renewable energy policy. His Royal Highness visited the plant at Llwyn Isaf in Gwynedd, North Wales ahead of the full operations starting at the end of the summer." "While it isn't entirely clear where all of this waste is diverted, it is evident that 89% of food waste is being composted or anaerobically digested for conversion to biogas, any clothing waste is being donated or recycled, and all construction waste ..."
"An onsite anaerobic digestion plant run by crops producer Barfoots at Botley, Hampshire has won the Best AD Project Award at the UK AD & Biogas Industry Awards 2013. Dr Clare Lukehurst (left) was presented with her lifetime achievement award by Dr ..."
"Cheesemaker Wyke Farms is aiming to be 100% self sufficient in green energy after ploughing £3M into a biogas and solar project." Returning now to the subject of the UK's Green Investment Bank, there is further encouragement that more funding will be available, in the extract below. "...The bank is also actively investigating the opportunities for debt financing for AD projects. Government research has indicated that AD could deliver between 3 and 5 TWh of electricity by 2020 but the industry itself remains concerned about sources of funding, particularly in relation to senior debt finance." So, despite slow and indecisive government action, the anaerobic digestion industry moves forward... Clearly, the industry is making it's case heard well enough for a measured growth, but if the coalition had meant what it said about "being the greenest government yet", when it came into power. we would surely be much further ahead by now?